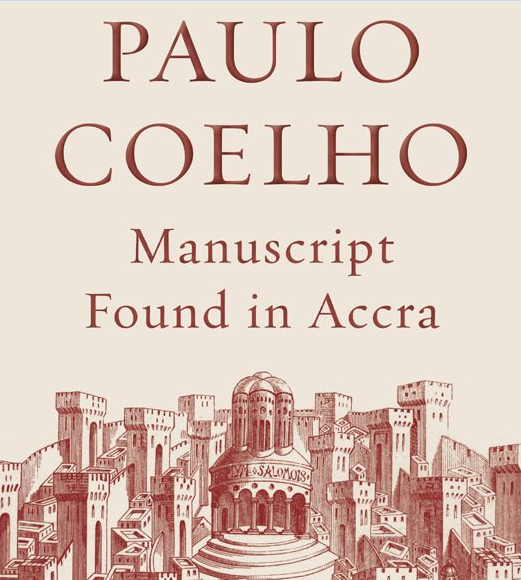 Paulo Coelho’s latest book, Manuscript Found in Accra, is a gem like all his others. Inventive as always, Coelho tells his tale as a transcription of a manuscript written in Arabic, Hebrew and Latin, discovered by an English archaeologist in 1974. The document’s origin was traced to Accra, a city on the southern coast of Ghana. The life lessons of this 192 page-turner by Coelho are immense, masterfully crafted, threaded, woven, brought to life, nourished and laid at our feet for our choosing. Not just lightning in a bottle but wisdom we already know – if we listen to ourselves, if we pay attention to the world, if we care what happens and dare to make a difference first in our own lives and thus in the collective consciousness of the Universe. We learn those who never lost a battle, avoided scars and taking action, those who eschewed the powerful emotions of humiliation, loneliness, uselessness and despair, also missed the open arms of love and plenitude of beauty that crossed their paths. The manuscript warns that by wasting energy to forego adventure and to shun change, we will likely squander our blessings of love and be quickly and quietly killed by routine in the dead of night… and no one will mourn our passing. A delightful book… Buy it, download it, borrow it, somehow get your hands on it and read it again and again as I have. A personal note – I wrote Chakra Secrets before reading Coelho Aleph, and was struck by the theme of past lives which ran through both stories. Now, I’m amazed that his latest book echoes some of the themes from my upcoming book, Chakra Secrets: On Mothering. Has Paulo Coelho also inspired you? Let me know which of his is YOUR favorite book. I’m so happy you reviewed Coelho’s latest book. After reading The Alchemist four years ago, I spent a few months reading the rest of his novels. The journey he takes us on is always different. I hadn’t gotten around to this one yet but with your review I’m moving it to the top of my list. Now, I can’t wait!!! This is indeed a wonderful read from a master storyteller, Becca. I am as fascinated by his writing as I am by yours and hope that you are coming out with a new book soon.